Age-related macular degeneration — also called macular degeneration, AMD or ARMD — is deterioration of the macula, which is the small central area of the retina of the eye that controls visual acuity. The health of the macula determines our ability to read, recognize faces, drive, watch television, use a computer, and perform any other visual task that requires us to see fine detail. Macular degeneration is the leading cause of vision loss among older Americans, and due to the aging of the U.S. population, the number of people affected by AMD is expected to increase significantly in the years ahead. Dry AMD is an early stage of the disease and may result from the aging and thinning of macular tissues, a loss of pigment in the macula or a combination of the two processes. Dry macular degeneration is diagnosed when yellowish spots known as drusen begin to accumulate in and around the macula. It is believed these spots are deposits or debris from deteriorating tissue. Gradual central vision loss may occur with dry macular degeneration but usually is not nearly as severe as wet AMD symptoms. 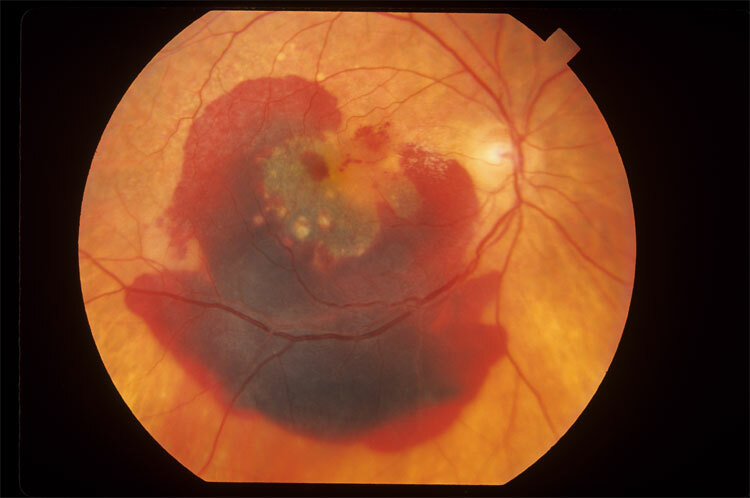 Dry AMD, through a period of years, can slowly progress to late-stage geographic atrophy (GA) — gradual degradation of retinal cells that also can cause severe vision loss. rmal blood vessel growth, is the body's misguided way of attempting to create a new network of blood vessels to supply more nutrients and oxygen to the eye's retina. Instead, the process creates scarring, leading to sometimes severe central vision loss and blindness.